Today’s men’s retreats need to step it up a notch. More often than not men’s ministry leaders complain that setting up a weekend men’s gathering is incredibly difficult. Women’s retreats tend to have no problem gaining guests, but why are men not as willing to sign up? 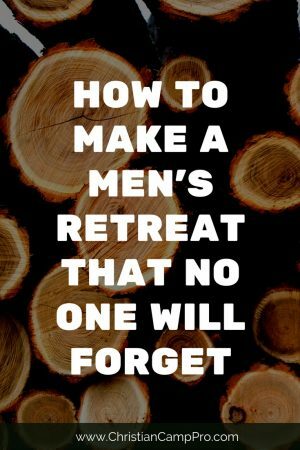 That’s because men’s retreats tend to focus on one super manly “be the head and not the tail” generic idea. Now, I am not saying it’s wrong for men to be manly, but some men like camping, some like technology, some photography and some all or none of the above. Do It Yourself projects are almost always going to be a favorite among men. This type of activity gives a guy a chance to do what they do best, work with their hands. A DIY leather belt making project also gives them something that they can take home with them after the retreat is over. A craft like making a belt also gives them something that will remind them of their experiences. Another example of a Do It Yourself project is creating homemade flavored toothpicks. Any activity that gives a guy an opportunity to make something with their hands is a really good thing. Making a useful item like a toothpick with a unique flavoring is another great retreat activity that could be very popular. Making things with their hands is generally something that most guys enjoy to do. So it would make total sense that when it comes to organizing a men’s retreat that the organizer would be sure to include activities such a making homemade beef jerky. Fortunately, any or all of the above-listed crafts are not likely to threaten the manhood or jeopardize the masculinity or put their Man Card in any danger. As a matter of fact, most men would be pretty proud of themselves for being able to make their own batch of beef jerky and share it with friends and family. The same could be said about flavored toothpicks and if anyone would be proud of making their own unique handmade leather belt.